L 6″ (15 cm). Sexes similar. Loud “ki-deeeee.” Song is series of trilling notes on one pitch, cricket-like in quality. Description: Finely mottled gray above, with contrasting rust-colored rump; light eye-stripe; and fine streaking on pale breast. Outer tail feathers have buffy tips. Frequently bobs its head, especially when alarmed. Behavior: Frequently constructs a path of pebbles or rock chips leading to its nest. The purpose of this behavior is not understood. 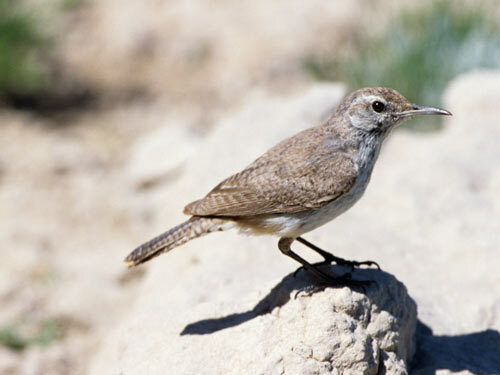 Habitat: Found on eroded slopes and badlands, rocky outcrops, cliff walls, and similar arid environments. 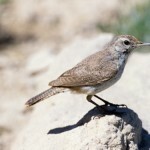 Where in Nebraska: Common spring and fall migrant and summer resident in western Nebraska, becoming rarer in the east. 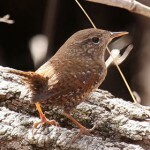 Fun Facts: Rock Wrens usually build a walkway of small pebbles that lead to its nest cavity.